Fayetteville, N.C. handstamp Paid 5 (CSA catalog Type A) on cover, postmarked Nov. 27, 1861. 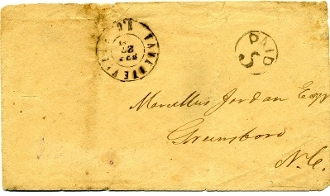 Addressed to Marcellus Jordan (Confederate mail carrier out of Greensboro, North Carolina) in Greensboro, N.C. CSA catalog value $200.00. Sealed tear at top, otherwise very fine.